Draft: 2012, Philadelphia Phillies, 6th rd. Cameron Edward Perkins…resides in Indianapolis, IN….attended Purdue University, where he played three seasons from 2010-2012…was named unanimous First-Team All-Big Ten selection, First Team ABCA All-Mideast Region, Big Ten All-Tournament Team, Academic All-Big Ten in 2012 after hitting .355 with nine homers and 61 RBI in 58 games for the Boilermakers…attended Southport High School in Indianapolis and was the Team MVP his junior and senior seasons…Originally selected in the 6th round of the First-Year Player Draft by the Philadelphia Phillies out of Purdue University. Spent most of the season with Triple-A Tacoma, hitting .257 with 10 homers and 48 RBI in 94 games...Had three different stints on the 7-day DL… his first stint led to rehab assignment with the Everett Aqua Sox, where he batted .250 with a homer and three RBI... Hit 7 of his 10 homers and batted .282 away from Tacoma…posted a .336 batting average with nine homers and 23 RBI against left-handers...Led the team in doubles (25) and finished fourth in homers (10) and stolen bases (8)...Matched his career-high with 11 homers. The Totals - Hit .182 (16x88) with 9 runs, 5 doubles, 1 home run and 8 RBI in 42 games with Philadelphia... Debut - Made his Major League debut with the Phillies on June 20 vs. St. Louis... Firsts - Recorded his first Major League hit (a single) off Michael Wacha on June 21 vs. St. Louis…hit his first Major League home run off Justin Nicolino on Sept. 14 vs. Miami... Minor League Tale - Appeared in 76 games with AAA Lehigh Valley, batting .288 (74x257) with 37 runs, 18 doubles, 1 triple, 7 home runs and 27 RBI. In 117 games with AAA Lehigh Valley, hit .292 (119x408) with 47 runs, 20 doubles, 4 triples, 8 home runs and 47 RBI…named an International League Mid-Season All-Star. Spent the entire season with AA Reading, batting .252 (95x377) with 51 runs, 25 doubles, 1 triple, 11 home runs and 51 RBI in 100 games…named an Eastern League Mid-Season All-Star…had two DL stints with back strains: June 25 - July 3 and Aug. 23 - Sept. 3. Appeared with AA Reading and AAA Lehigh Valley…began the season with Reading, where he batted .342 (67x196) with 25 runs, 19 doubles, 1 triple, 3 home runs and 34 RBI in 52 games…promoted to Lehigh Valley on June 3…in 74 games with Lehigh Valley, hit .216 (55x255) with 17 runs, 9 doubles, 3 triples, 2 home runs and 17 RBI. Split the season between advanced-A Clearwater and the GCL Phillies…in 103 games with Clearwater, hit .295 (114x387) with 54 runs, 30 doubles, 5 triples, 6 home runs and 53 RBI…named a Florida State League Mid-Season All-Star…was placed on the disabled list with a fractured left wrist on June 1; activated on July 5…went 4-for-7 (.571) with 1 run, 1 double, 1 home run and 1 RBI in 2 games on a rehab assignment with the GCL Phillies. Began his pro career with the GCL Phillies, where he hit .158 (3x19) with 3 RBI in 5 games…on June 23 promoted to short-A Williamsport, where he batted .304 (82x270) with 31 runs, 23 doubles, 1 triple, 1 home run and 38 RBI. 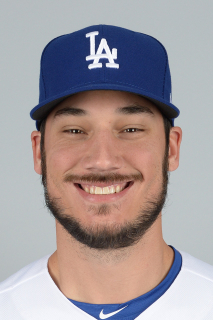 February 11, 2019 OF Cameron Perkins assigned to Oklahoma City Dodgers. January 4, 2019 Los Angeles Dodgers signed free agent OF Cameron Perkins to a minor league contract and invited him to spring training. November 13, 2018 Leones del Escogido placed OF Cameron Perkins on the reserve list. November 2, 2018 1B Cameron Perkins elected free agency. October 23, 2018 OF Cameron Perkins assigned to Leones del Escogido. July 20, 2018 Tacoma Rainiers activated 1B Cameron Perkins from the 7-day disabled list. July 12, 2018 Tacoma Rainiers placed RF Cameron Perkins on the 7-day disabled list. June 25, 2018 Tacoma Rainiers activated RF Cameron Perkins from the 7-day disabled list. June 20, 2018 Tacoma Rainiers sent RF Cameron Perkins on a rehab assignment to Everett AquaSox. May 30, 2018 Tacoma Rainiers placed RF Cameron Perkins on the 7-day disabled list. April 2, 2018 Seattle Mariners sent CF Cameron Perkins outright to Tacoma Rainiers. March 11, 2018 Seattle Mariners optioned RF Cameron Perkins to Tacoma Rainiers. December 11, 2017 Seattle Mariners claimed Cameron Perkins off waivers from Philadelphia Phillies. September 3, 2017 Philadelphia Phillies recalled CF Cameron Perkins from Lehigh Valley IronPigs. August 23, 2017 Philadelphia Phillies optioned CF Cameron Perkins to Lehigh Valley IronPigs. August 15, 2017 Philadelphia Phillies recalled Cameron Perkins from Lehigh Valley IronPigs. August 10, 2017 Philadelphia Phillies optioned CF Cameron Perkins to Lehigh Valley IronPigs. August 5, 2017 Philadelphia Phillies recalled Cameron Perkins from Lehigh Valley IronPigs. August 2, 2017 Philadelphia Phillies optioned CF Cameron Perkins to Lehigh Valley IronPigs. June 20, 2017 Philadelphia Phillies selected the contract of Cameron Perkins from Lehigh Valley IronPigs. January 11, 2017 Philadelphia Phillies invited non-roster LF Cameron Perkins to spring training. November 21, 2016 OF Cameron Perkins assigned to Gigantes del Cibao. April 2, 2016 CF Cameron Perkins assigned to Lehigh Valley IronPigs from Reading Fightin Phils. March 9, 2016 OF Cam Perkins assigned to Philadelphia Phillies. September 4, 2015 Reading Fightin Phils activated LF Cam Perkins from the 7-day disabled list. July 4, 2015 Reading Fightin Phils activated LF Cam Perkins from the 7-day disabled list. April 5, 2015 LF Cam Perkins assigned to Reading Fightin Phils from Lehigh Valley IronPigs. March 15, 2015 LF Cam Perkins assigned to Philadelphia Phillies. October 9, 2014 OF Cam Perkins assigned to Tiburones de La Guaira. June 3, 2014 LF Cam Perkins assigned to Lehigh Valley IronPigs from Reading Fightin Phils. March 30, 2014 OF Cam Perkins assigned to Reading Fightin Phils from Clearwater Threshers. March 14, 2014 OF Cam Perkins assigned to Philadelphia Phillies. October 11, 2013 OF Cameron Perkins assigned to Peoria Javelinas. July 5, 2013 Clearwater Threshers activated OF Cam Perkins from the 7-day disabled list. July 3, 2013 Clearwater Threshers sent OF Cameron Perkins on a rehab assignment to GCL Phillies. June 1, 2013 Clearwater Threshers placed OF Cameron Perkins on the 7-day disabled list. April 3, 2013 OF Cameron Perkins assigned to Clearwater Threshers from Williamsport Crosscutters. June 23, 2012 Cameron Perkins assigned to Williamsport Crosscutters from GCL Phillies. June 18, 2012 Cameron Perkins assigned to GCL Phillies from Philadelphia Phillies. June 7, 2012 Philadelphia Phillies signed OF Cameron Perkins.